Malware and spyware can cause computer slow down and unwanted advertisements. Operating systems can often be restored to a known, good state to get you running. E-mail can be setup in a browser mail reader or in a stand-alone mail reader. Internet phone and video calling programs such as Skype and others are fun to use. Software installation can be confusing and isn’t always easy to get right. A wireless home network lets you use the Internet with your laptop all around your home. New computers may have cables to attach and need the operating system activated. Adding RAM (memory) is one of the best ways to improve computer performance. A larger capacity hard drive lets you have more stored data (songs, videos and pictures). Most software does not come with training or tutorials. I can teach you to use it well. Windows upgrades can bring your computer to a modern state of usefulness. Preventive maintenance can help avoid a poorly performing or an unusable computer. Prevent data loss with offsite, online backup. Protect all the images on your computer. I design and maintain Web sites. New sites can be custom or use popular CMS programs. I can scan and restore faded and damaged photos and make beautiful prints for you. I am available to speak to any group about computer use and care. After I visit your computer the first time, I might be able to support it through the Internet. Remote computer support is safe, effective, secure and affordable. 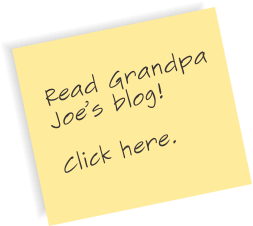 Grandpa Joe comes to you to take care of computer problems–days, nights and weekends. Fair, reasonable rates and value are hallmarks of my company.